Editor Of Bangladesh's Only LGBT Magazine Is Hacked To Death : The Two-Way The killings of gay rights activist Xulhaz Mannan and his friend are the latest in a recent string of grisly attacks in the country. The body of gay rights activist Xulhaz Mannan rests in a wooden coffin as people pay their respects in Bangladesh's capital, Dhaka. Mannan worked for the U.S. Agency for International Development and was the editor of Roopbaan, the country's only LGBT magazine, and had helped organize a rally for LGBT youths called The Rainbow Rally on April 14, the Bengali New Year. Another friend of Mannan's, Sara Hossain, told The New York Times that the activist had received death threats from people who opposed the rally. An al-Qaida-linked group said it was responsible for the two killings. 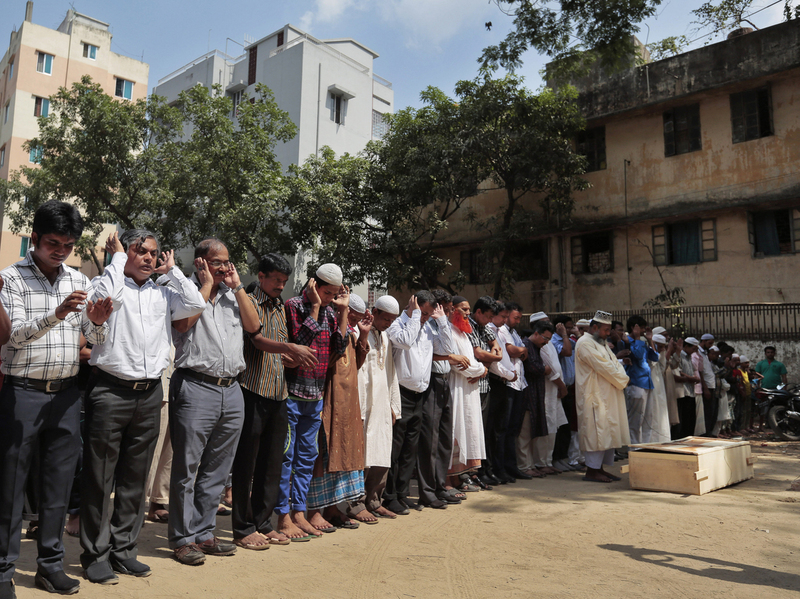 The Associated Press reports that "the claim by Ansar-al-islam — which said it targeted the two men on Monday night because they were 'pioneers of practicing and promoting homosexuality' — raised doubts about Prime Minister Sheikh Hasina's repeated assurances that authorities have the security situation under control." USAID published a statement following Mannan's death, calling him "a dedicated and courageous advocate for human rights." "Xulhaz sought to shape a society that was more diverse and inclusive. He believed in the people of Bangladesh, and he strove to make the world a better place for everyone." "Abdur Rahim, the caretaker of the six-story building in which Mr. Mannan lived, said two young men posing as couriers entered Mr. Mannan's first-floor apartment on Monday evening. Four other men then followed them into the apartment.
" 'We heard shouts and then loud bangs,' Mr. Rahim said. "Mr. Rahim said building guards and a police patrol tried to stop the group as they tried to escape after the killing. The killers escaped by firing shots that injured a policeman and a building guard, Mr. Rahim said." Mannan and his friend were cut down just days after English professor Rezaul Karim Siddique was hacked to death as he walked to his home in the city of Rajshahi, Bangladesh. Julie reported over the weekend that Siddique may have attracted attention with his focus on cultural enrichment after he organized a music school. She notes that the latest attacks might signal a shift: "It appears that the assailants may be expanding their range of targets. Previously, the grisly attacks have focused on atheists and bloggers critical of Islamic fundamentalism." Earlier this month, an atheist law student named Nazimuddin Samad was hacked and shot to death by men on a busy street in Dhaka. Samad reportedly had been named on a "hit list" of bloggers sent to the Bangladesh Interior Ministry by a group of radical Islamists in 2013. As the Two-Way has reported, "last year, at least four secular bloggers were hacked to death in Bangladesh and a publisher who worked with one of those bloggers was stabbed to death."